For any and all combinations of your favorite Marvel characters, check out our Marvel Team-Ups category here at Superheroes Direct. 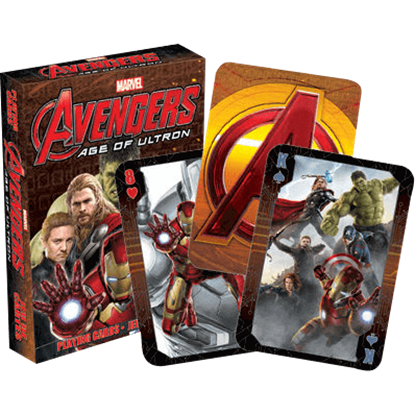 Bringing you the collectibles and apparel featuring popular groupings of heroes, such as the Avengers, shop here for all your character mash-up needs. 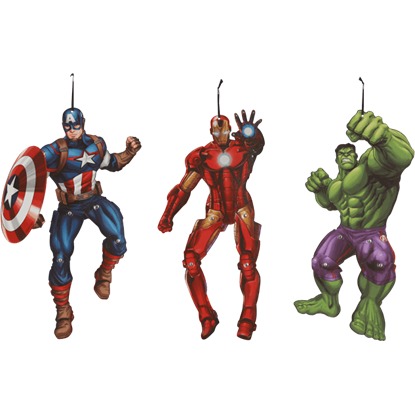 We offer diorama sets that include a variety of characters in their classic comic book garb, such as Spider-Man, Thor, Iron Man, Deadpool, Captain America, and more, perfect for starting up any collection of figures. 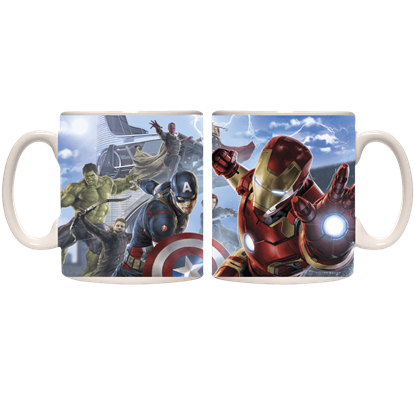 Many of our home decor items, t-shirts, and drinkware, accessories, and keychains are emblazoned with the characters and logos from the MCU Avengers films, including Age of Ultron and Avengers Assemble. Here you can find sets of socks, jewelry, and other accessories all displaying multiple characters from the massive Marvel universe. Rounding out our selection are collectible playing cards, perfect to have on hand at any gathering of super friends. Our Marvel Comics t-shirts are also available in youth sizes, perfect for any young heroes in training. The menacing android Ultron is shown in front of a dark red background. 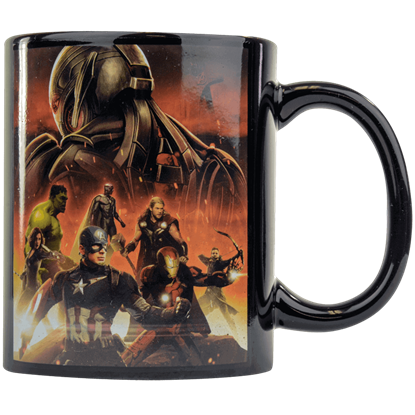 This Avengers Age of Ultron Group Shot Mug also displays Vision, Thor, Hawkeye, Iron Man, Captain America, Black Widow, and Hulk in the lower foreground. 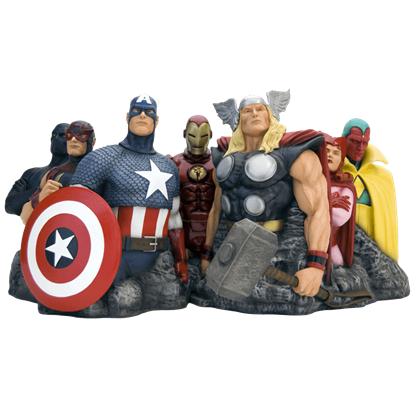 Cast in heavyweight polystone and hand-painted, the Avengers Assemble Alex Ross Fine Art Sculpture captures eight of the primal Avengers - Captain America, Thor, Black Panther, Scarlet Witch, Vision, Hawkeye, Iron Man and Wasp. 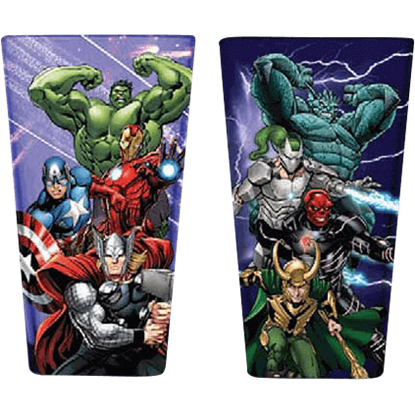 An incredible set of collectible drinkware which fans of Marvel Comics will surely love to own, the Avengers Assemble Drinking Glass Set includes two colorfully designed drinking glasses which feature eye catching comic themed designs. An extraordinary yet simple means to display your love for the Avengers comic, the Avengers Black Logo T-Shirt features a black Avengers logo with yellow bordering upon the chest of a shirt, which is a slightly lighter shade of black. The Avengers soar, punch, and leap into action on this collectible Avengers Group Circle Pint Glass. 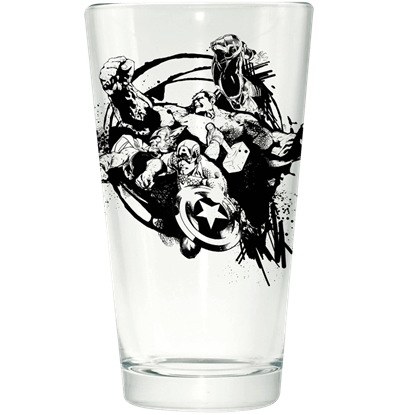 The black sketch image on this superhero glass displays Iron Man, Hulk, Thor, and Captain America battling in front of a circle logo. 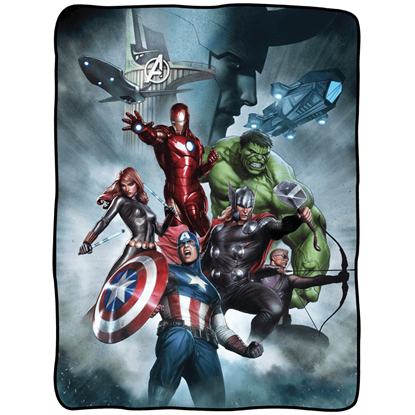 Iron Man, Captain America, Black Widow, Hawkeye, Hulk, Vision, and Thor leap into action in front of Avengers Tower in this collectible mug with a wrap-around image. The Avengers in Action Mug is perfect for jump-starting your day! Considered to be the mightiest heroes on Earth, the Avengers are a conglomeration of do-gooders who dedicate their existence to combating evil. You can show your support of their cause with the Avengers Logo Etched Drinking Glass. With such a talented group of heroes, who does not love the Avengers? No matter which version of the team-up you prefer, you can easily display your love for Marvels finest on your favorite outfits with the Avengers Logo Lapel Pin. 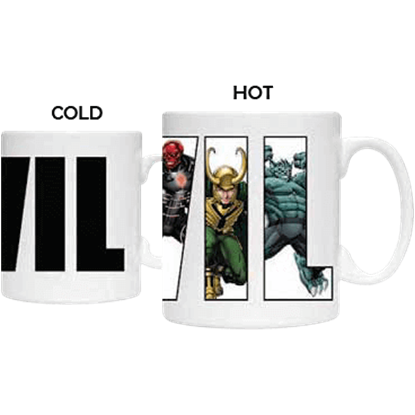 Featuring a spectacular design which changes in the presence of heat, the Avengers Villain Heat Change Mug is a magnificent piece of Marvel Comic themed drinkware which provides you notice when its contents are hot.